(Mason.Adam.Dinith!) is an original band, recording artists and performers already rumbling the music scene! Though M.A.D! only formed in June of 2017, this multi-award winning power-trio is working diligently to bring their original, melodic brand of alt/nu metal to ears, eyes and venues everywhere. 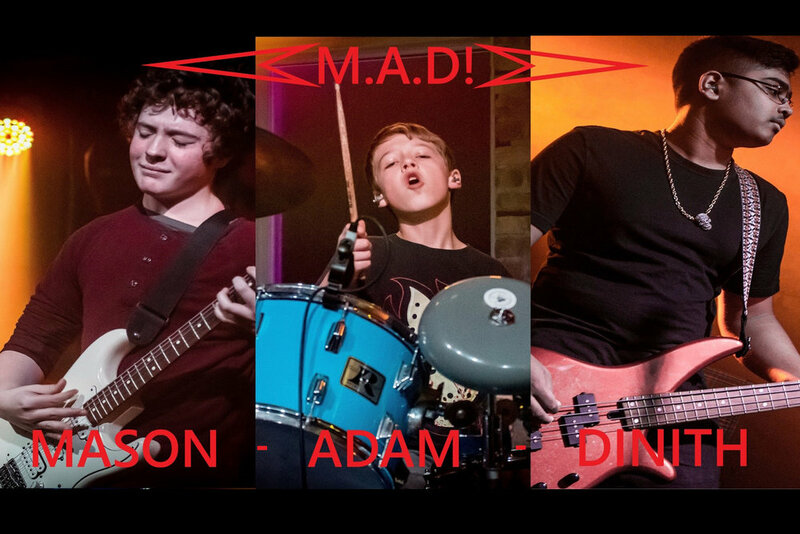 Brilliant, roller-coaster song-writing styles from beyond their years with diverse vocals and sweet harmonies are raising eyebrows everywhere M.A.D! performs. The band is already redefining that little word and what the world sees in those 3 letters! • Canadian rock icons Sloan have shared the concert stage with them! • Legendary Producer and Engineer Garth Richardson (Rise Against, Rage Against The Machine, Red Hot Chili Peppers) sought them out in the green room after being blown away by one of their shows! and one of them isn't even in high school yet!